Use this Mortgage Interest Tax Deduction Calculator to determine how much you could save in income taxes. Interest paid on a mortgage is tax deductible if you itemize on your tax return. Mortgage points that are paid to lower your interest rate can also be tax deductible. The itemized deduction for mortgage insurance premiums, which was set to expire at the end of 2014, has been extended through December 31, 2016. See here for the IRS Mortgage Interest Tax Deduction pamphlet. Click on the "View Report" button to view the results in detail, including a full amortization schedule. 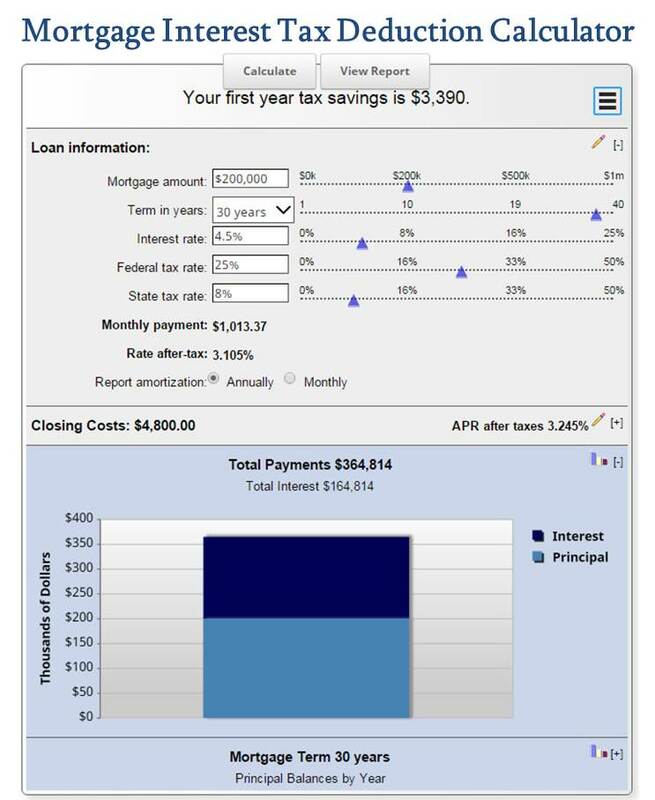 This will also calculate the Mortgage APR, as well as the approximate APR after tax savings on a new home mortgage. Looking for a different mortgage calculator? More Mortgage Calculators Here. Feel free to use current Mortgage Rates in this mortgage calculator.